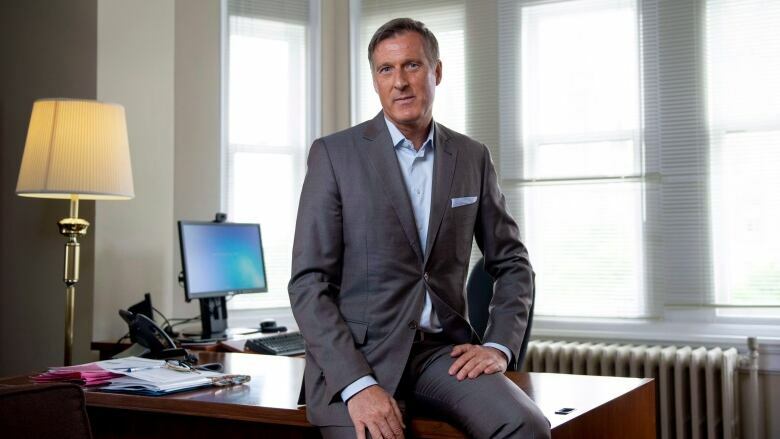 Conservative MP Maxime Bernier says he's the only politician in Ottawa who supports truly free trade with the U.S., and while it's not his role to negotiate NAFTA with U.S. President Donald Trump, he thinks it's "sad" he's the only one who wants to put supply management on the trading table. In the weeks following Conservative Leader Andrew Scheer's decision to strip Bernier of his critic role, the Beauce MP has maintained a pretty low profile. But as trade tensions increase between Canada and the U.S., the staunch advocate of ending Canada's supply management system for milk, eggs and poultry — a program popular with dairy farmers in Quebec, including in his riding — feels compelled to speak up. In an interview with The Canadian Press, he said every political party in Ottawa wants to keep the very system that Trump wants axed, and that intransigence is preventing Canada from reaching a deal. The U.S. administration has frequently lashed out at Canada's system for controlling the price and supply of dairy, eggs and chicken — but Canada has adamantly and repeatedly insisted that's not on the table. In a fundraising email sent recently to supporters, Bernier wrote that he's the "only politician in Ottawa who says we should sit down with Trump and start meaningful negotiations, instead of playing politics with the 20 per cent of our economy that depends on trade with the US." When asked in the interview what Scheer might think of his email blast, Bernier quickly interjected, "But that's the reality. That's the reality. "I'm the only one who supports real free trade with the U.S., I'm the only one who is against a trade war with the U.S., and I'm the only one who wants to be sure that we'll have a better economic prosperity for our country," he said, adding the Conservatives "must not" support the government in its trade war with the U.S. He stops short at wanting in on the talks. "My role is to try to convince the government, my party, the politicians in Ottawa, that their position is wrong," he said. Bernier questioned why his party would support a "socialist policy" and said the dairy, poultry and egg producers are holding the economy hostage. "We just need to convince the government and it's sad that I'm the only one. The only elected member of Parliament who's speaking for 35 million Canadians on that issue and now the government, they're putting our economy at risk with that position." In June, Scheer removed Bernier's critic title after Bernier posted a controversial chapter of his forthcoming book on his website — a book he had already agreed to postpone "for the sake of maintaining harmony in our party." The chapter accuses Scheer of signing up "fake Conservatives" for the sole purpose of defeating Bernier in the Conservative leadership race. In April, Bernier promised to shelve the book's publication indefinitely, but the offending chapter resurfaced the following month in the midst of a string of pointed attacks from Trump on how Canada treats U.S. dairy producers. Bernier said he respects Scheer's decision to remove him from the shadow cabinet but says he won't change. "I'm a Conservative. I'm speaking about conservative values, conservative principles. I'm fighting Pierre Elliott Trudeau's socialist policy. I'm a real conservative. So I must have the right to speak about it and convince more members and more Canadians." Bernier said he hopes the party will adopt a new approach on supply management at the Conservative convention in Halifax later this month, noting a handful of riding associations have put resolutions forward for consideration. Conservative MP James Bezan said he "disagrees completely" with Bernier's comments on the Tories' trade strategy, adding supply management is party policy. Bezan said he wishes Bernier would "show some loyalty to our leader." Brock Harrison, a spokesman for Scheer, would only say: "Hundreds of thousands of Canadians' jobs and the overall health of our economy are at stake with NAFTA. It would be the top priority of a Conservative government to get the best deal for Canadians." In a new fundraising email sent to supporters Thursday morning Bernier announced he has paid off his leadership campaign debt and said, "an exciting new chapter is beginning." Bernier was about $250,000 in debt following his leadership defeat in May 2017. "I am now free to devote all of my time, all of my efforts, and all of the funds I will raise in the future, to defending principled conservative ideas."